The Steco headtube mounted rack mounts directly to the headtube of your bike and carries luggage with the weight on the frame, not on the handlebars. The maximum size of package which can be carried is limited in the vertical direction by the height of your handlebars, so consider ordering a longer handlebar stem together with this rack. 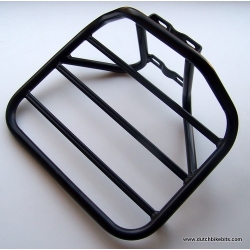 The rack area is 35 cm x 28 cm. Works with suspension forks (though bikes with suspension forks are not ideal for carrying cargo). Supplied with mounting brackets which are spaced at 10 cm between their centres. The minimum length of clear head tube which this bracket can be mounted on is 12 cm. See additional images for an illustration of this. The maximum diameter of headtube which can be accommodated by the brackets supplied with the rack is 45 mm. Two sets of brackets are provided, straight and angled, to accommodate a wide range of head tubes. Check the additional photos for the sizes. Weight approximately 1.7 kg. For well over 80 years, Steco have produced a wide range of very strong bicycle racks used by generations of Dutch people to carry a wide range of cargo and people. this very conservative company rates this rack as having a capacity of 10 kg.